Click on The Warlords and The Tragedy of Prince Tudor (previously published works) for further details. The abridged version of the two parts of The Warlords can be performed in one evening as a normal-length play. 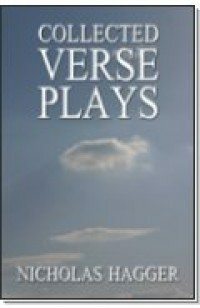 For the other two verse plays see Publisher’s Outline below. Ovid Banished answers the question of why Augustus banished or “relegated” Ovid to the Black Sea town of Tomis in AD 8, and dramatizes the Roman poet’s spiritual metamorphosis. As in Shakespeare’s Antony and Cleopatra, the play contrasts Rome’s sterile, imperial culture with the fertile wilderness of Tomis. The perception raises interesting questions about the true nature of civilization. Banishment for Ovid, is a journey towards the Reality known by the soul. The theme of world government is also prominent, as it was the ruling ambition of Augustus’s life. The imperialist state is shown to work against the sovereign poet, while the deification of the Emperor is presented as the ultimate symbol of secular humanism. Ovid, as poet and prophet, sees that, despite its material success, Rome is in spiritual decline and must ultimately give way to the hordes of barbarians within its borders. Ovid Banished is about the head of a world government (Augustus) banishing a leading artist and intellectual. It is about a censorship in our time. Echoes include the USSR’s banishing of Solzhenitsyn. The Rise of Oliver Cromwell is an innovative play which explores the reasons for Cromwell’s extraordinary rise to dictatorship. It draws on material in The Secret History of the West, e.g. the discovery of two letters that show that Cromwell was financed from Holland. The deal was that he would kill Charles I in return for financial support for his New Model Army, and that he would readmit the Jews (exiled in 1290 by Edward I) to England, which happened after the visit of Menasseh ben Israel in 1656. The play thus presents a new view of the Civil War. By uncovering the Rosicrucian and Freemasonic roots of Cromwell’s power and vision Nicholas Hagger manages to solve a number of historical problems of the 17th century (such as why King Charles was executed, who acted as Cromwell’s ideological mentor, who funded the New Model Army and what the true role of Holland was in the Civil War). At a time when many considered that Tony Blair attempted to complete the republican revolution begun by Cromwell, several themes of the play will have an uncanny resonance for modern audiences. For instance, the imperialist Cromwell split up the Kingdom into 12 administrative regions and subjugated British sovereignty to his Utopian vision of a worldwide confederation of states. The play presents an original view of Cromwell based on thorough historical research, and sheds light on the ancient spiritual conflicts that drive contemporary politics. These four plays by Nicholas Hagger (or five if the two part of The Warlords are counted separately) mean that there is now a new movement of verse drama with unnaturalistic settings after the manner of Sophocles and Shakespeare, a revival of the verse play after 350 years (discounting once-off false starts by Dryden’s All for Love, 1678, and T.S. Eliot’s Murder in the Cathedral, 1935). Three and a half centuries after the form declined c.1640, Nicholas Hagger revives verse drama with The Warlords, a panoramic two-part drama which focuses on the fortunes of General Montgomery after D-Day, and his conflict with Eisenhower. The second drama, The Tragedy of Prince Tudor, tells the story of the Prince’s heroic attempt to preserve the culture and identity of his disintegrating kingdom. Two of these plays are published for the first time. Ovid Banished dramatizes the Roman poet’s spiritual metamorphosis. The imperialist state is shown to work against the sovereign poet, while the deification of the Emperor is presented as the ultimate symbol of secular humanism. Ovid, as prophet and poet, sees that, despite its material success, Rome is in spiritual decline and must ultimately give way to the hordes of barbarians within its borders. The Rise of Oliver Cromwell is an innovative play which explores the reasons for Cromwell’s extraordinary rise to dictatorship. With uncanny resonances for modern audiences, it sheds light on the ancient spiritual conflicts that drive contemporary politics.